I asked about Russiagate and Israel's nuclear arsenal at the Bulletin of the Atomic Scientists Doomsday Clock event Thursday at the National Press Club. Sam Husseini: I'd like to raise two things that I don’t believe have come up explicitly and I'd like you address them. One, explicitly, is Russiagate. Several people including fellow Nation writer Steve Cohen, a Russia expert, have warned that the focusing and the charges and demonization of Putin have reached such a level that they cause a threat, that they increase the instability and the dangers between the U.S. and Russia. If someone could make an assessment about the dangers of that. I am not talking about Trump’s tweets. I am talking about the Democratic party establishment and allied media. And the other thing that I don’t believe has come up, there's been some discussions about Iran, is Israel's nuclear weapons arsenal. Israel just targeted Iranian forces inside Syria. We have Turkey, a NATO member bound by Article 5, involved in Syria as well. It is my understanding that the U.S. government has refused to even acknowledge the existence of Israel's nuclear weapons arsenal, which was of course exposed years ago by Mordichai Vanunu . Do you recommend a change in that and can you address how that long-standing abnormal can be addressed? Moderator, Rachel Bronson (president of the Bulletin of the Atomic Scientists): Thank you. I am going to turn the Israel question over to Sharon, but first I know for Dr. Parry, Gov. Brown. If you like to answer the first part of the question, I am happy to take it too, which is the demonization both of Vladimir Putin and the focus on Trump, and the interaction between the two. How should we be thinking about the demonization of leaders and particularly those two, at the time when we need to be, when these issues are so stark? William Parry (chair of the Bulletin's Board of Sponsors, former Sec. of Defense): I defer to Gov. Brown about that. 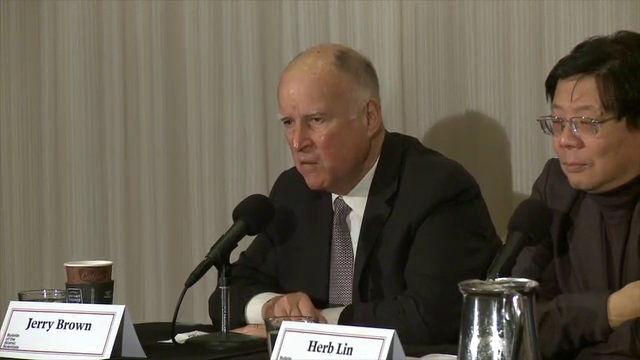 Jerry Brown (executive chair of the Bulletin; former governor of California): Yeah. I think it is stupid for Democrats to be attacking Putin on all issues and not holding open the channel of nuclear dialogue. Yes, deal with the issues in Syria, and killing diplomats, and Ukraine, and Crimea and all the rest of that, but that doesn’t warrant a nuclear blunder that kills billions of people, or millions. So yes, whether you're a Democrat, a Republican, or somewhere in between, we need to have dialogue. And something that might help is a bit of humility. Yes, the Russians have plenty of faults, and sins I might even say, but we too have to look in the mirror and see ourselves, and we're not perfect. So, in an imperfect world with imperfect human beings, the only path forward is dialogue. Dialogue about the most important threat facing humanity. So yes, knock it off guys, and ladies. Let’s talk to Putin. Let's talk to anybody else who can do the kind of damage that you're hearing about from this panel of nuclear scientists. Sharon Squassoni (Former State Department official, research professor at George Washington University, Bulletin Atomic Scientists board member): I would just add, one of the disturbing things about not having arms control channels open is that in past instances of crises there was always a person-to-person connection. You know, you could always pick up a phone because you knew someone and trusted someone. And so that to me is a disturbing development. We no longer have those kind of interactions. And I think we need to reestablish them. Squassoni: -- On the question of Israel. I left the government around ten years ago, but yes, you are correct. It was always a kind of Alice in Wonderland experience trying to talk about Israel's nuclear weapons. Now that I'm out of the government, I can say: Yes, they do have nuclear weapons. That is a hard question bureaucratically. The way things are arranged but I agree. This administration is not going to tackle that. Perhaps it will wait until the next one. But ultimately, if we are looking for a fair and non-discriminatory, multilateral system that reduces risks, it completely has to take into account Israel. Full video of event on YouTube (my question starts at 38:30) and Twitter (at 43:30).